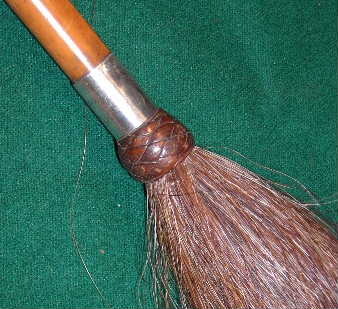 A chestnut horsehair fly whisk. This has a red-gold malacca cane shaft. There is a hole near the top for a wrist strap. It has a silver collar where the horsehair starts, this is hallmarked Birmingham 1942 and engraved "Melody 1932 - 1940". 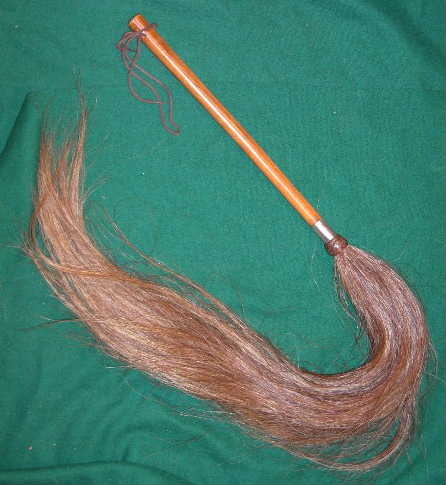 I assume that "Melody" was the chestnut mare whose tail makes up the whisk. I suppose it's a way of remembering a much loved horse - a bit like hooves turned into inkwells. These would be carried when riding and used to flick flies away from both horse and rider.